When the seawater pump on an offshore rig needed replacing, an air hoist supplied by materials handling specialists J D Neuhaus, was on hand to provide safe lifting of the components. 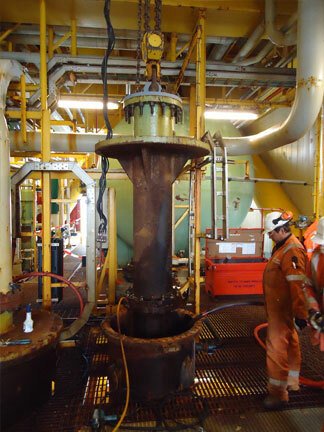 Seawater pumps are an integral part of the working environment within oil and gas offshore structures. Seawater itself is utilised for general cooling of on-site production activities, while also providing a major safety dousing factor in the event of fire or leakage occurring in the hazardous and potentially explosive offshore atmospheric conditions. The maintenance, repair or even total replacement of the associated pumps and pipework in such locations is undertaken by Gerritsen On- & Offshore Services BV, with work recently carried out at a rig located in the southern North Sea. A four man team undertook the dismantling of one pump and pipework assembly out of the three similar installations in the pump area. To handle the lifting and temporary storage of the components involved, an approximate 20 metre lift from sea level to an upper storage area was required. To undertake this task an air operated hoist model EH20 as manufactured by the J D Neuhaus company was utilised. This product offered a SWL capacity of 20 tonnes, providing intrinsically safe performance within such hazardous environments with appropriate Ex safety ratings for such work. 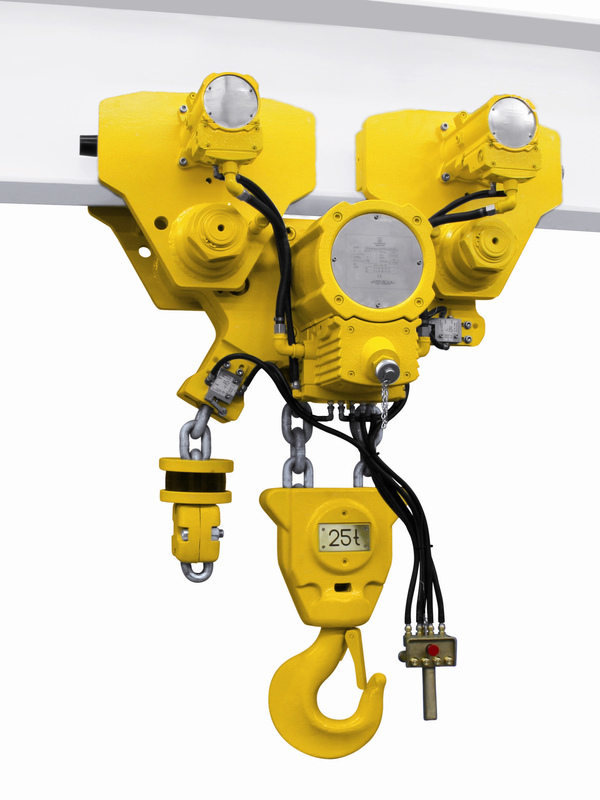 It was provided with a chain drop lift capacity of 12 metres, and included a similar length umbilical for the hoist hand controller with the operator located at the lower deck. The EH model JDN hoist was mounted on an overhead rail which provided the necessary lateral movements to facilitate individual load laydowns at a temporary storage area prior to undertaking the reassembly task. 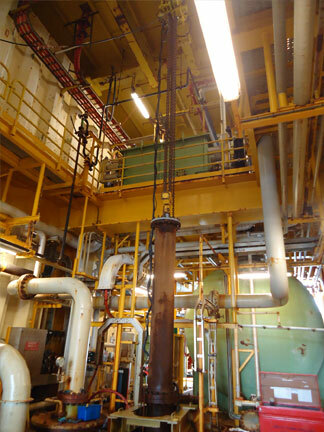 The pump riser pipework comprised a total of eight x 3.5 metre long x 16 inch diameter pipes, which were disconnected to provide two connected pipes per lift. The pump located at the bottom of the pipework was itself approximately 8 metres in length and weighed some 9250kg. The EH20 is part of the JDN monorail air hoist range designed for handling heavy loads while operating within confined spaces. A total of 11 models are available, with lift capacities ranging from 10 up to a full 100 tonnes. These hoists are insensitive to humidity and dust, while operating within a temperature range of -20°C up to 70°C. They incorporate a low-headroom compact design ideally suited to working in hazardous areas. They feature low air consumption with an instant starting vane motor requiring low maintenance. They also incorporate a fail-safe disc brake to hold loads safely in the event of interruption to the power air supply. Anti-climb and anti-drop devices are supplied as standard, together with lateral guiding plates. Increased spark and overload protection, rack and pinion drive, two-speed trolley travel control and filter silencers are also available as accessories. The pendant controllers incorporate an emergency shut-off valve and are designed for multi-function use. This includes the operation of twin hoists where they can be used in tandem or parallel configurations while still providing precise load control together with twin speed trolley travel movements. Gerritsen On- & Offshore Services BV are the authorised Dutch Sole Importer of JDN products.